Thanks to the movie franchise, most people can pick Marvel’s Thor out of a line-up. Yes, his name is a little goofy, but don’t let that stop you from learning more about Bill. Note: This write-up will contain spoilers for the comics listed. Who and what is Bill? When their home galaxy is destroyed, the surviving Korbinites hold gladiatorial contests to find a champion who will lead them to a new home. Bill emerges as that champion. To best protect the surviving Korbinites Bill is transformed into a cybernetic equine-like creature. With the remaining Korbinites in stasis, Bill and his sentient ship Scuttlebutt, set off to find a new home for the Korbinites. In their travels Bill and Scuttlebutt encounter Thor who, perhaps based on Bill’s monstrous appearance, sees him as a threat. An epic battle begins, and in the course of this battle...gasp...Bill is able to pick up Mjolnir, Thor’s enchanted hammer. As only those "deemed worthy" should be able to wield Mjolnir, this gets Odin’s attention. 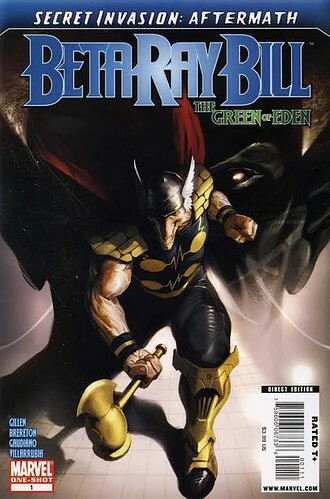 He orchestrates a more formal battle to the death between Bill and Thor. Odin rarely does anything without intent, and the volcanic landscape chosen for the battle gives Bill a slight edge due to his alien physiology (a lesson for Thor perhaps). However even as Bill bests Thor, he shows mercy and saves his life, proving himself a true champion. 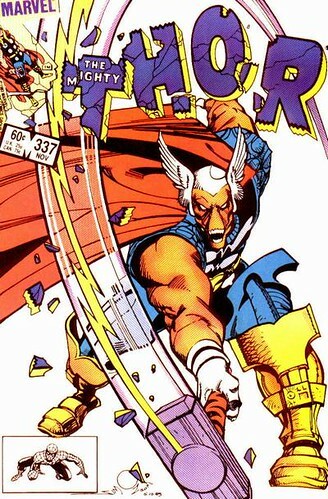 Odin rewards Bill with the gifts of Asgardian armor and his own hammer- Stormbreaker. Becoming the champion of his people was no picnic. In fact, Bill was the only one who survived the trials. His thanks: being transformed into a being that kind of looks like a cadaverous horse, a hero who looks nothing like a traditional hero. He looks like a monster, but this "monster" is the first character in Marvel history besides Thor who is worthy to lift Mjolnir, and subsequently acquire his own Hammer. That’s not to say he doesn't slip up sometimes. 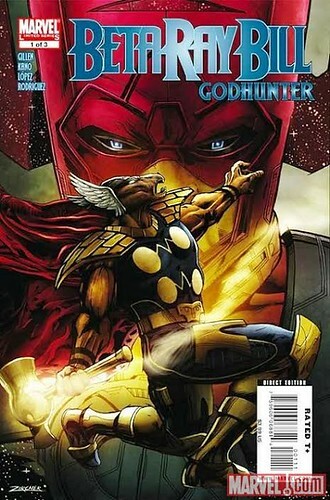 In the mini-series Godhunter, issues 1-3 Bill decides he has had it with cosmic entities that wipe out entire planets and civilizations. While Galactus isn’t the being that destroyed Bill home world, he decides he’s a good target. He and Scuttlebutt set out to first help evacuate planets that have been chosen for Galactus to feed on, then they destroy the planets before Galactus can feed. In the course of this quest Bill takes some questionable actions that cause him to no longer be able to lift Stormbreaker. His worth can only be won back by saving the very being he set out to destroy. I’m not the only one who finds Bill interesting, he also caught the eye of consummate Thor admirer, The Lady Sif. Sif is quite struck by Bills strength and nobility and the two strike up a mutual attraction. It doesn’t really get too far though since Sif is still pretty smitten with Thor (we know that’s going nowhere) and Bill is kind of a loner, Dottie, a rebel. He seems to be most content traveling the universe with the companionship (HA!) of his sentient spaceship. 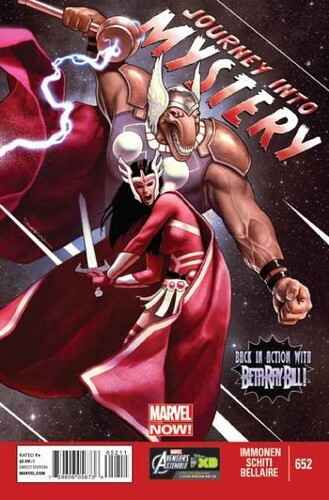 For more on the Bill/Sif team-up, check out Journey into Mystery, issues 652-655. With the upcoming Guardians of the Galaxy movie the non-comic reading public will soon be introduced to many of the more oddball characters from the Marvel cosmic pantheon. Not sure we will be seeing Bill among them yet, and frankly I'm not sure how he would translate to film. But if Marvel is willing to give a gun-toting raccoon and a living tree a chance, perhaps Bill will get his turn too.